In 2010, UNESCO added French cuisine to the list of cultural objects that are called ‘intangible cultural heritage’. The long history of French gastronomy leading up to this honor is a grand one, and it is a history influenced not only by centuries of French kings and queens, but also surrounding and faraway cultures. 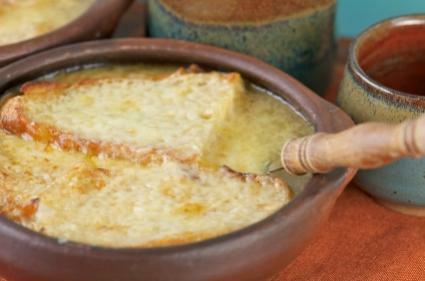 During the Middle Ages, French food was already an important part of life for many people, but a French meal looked very different then than it does nowadays. Perhaps the largest difference is that during this time, a large amount of different dishes were all prepared for a meal, but they were served in unison. This way of presenting food was aptly named service en confusion, where all food items were placed on the table at once, and much of the food was eaten with one’s hands. The practice of serving various dishes as separate courses would not be introduced until centuries later, as would the practice of serving each person at the table instead of putting the dishes on the table family style. Despite these differences in how people served and ate food, many features of 21st century French food were already in place. Food during this period already had rich sauces filled with spices. Though the techniques were different then, many dishes have their roots during this period, such as sweet pastries and large pieces of meat served with sauces or mustards. The culture of drinking alcoholic beverages also existed, but beer was more common than wine. Another important parallel between now and then is that the visual appeal of food was already considered paramount in the Middle Ages. Aesthetics have changed, but the idea that food is not only a treat for the taste buds, but also a visual feast, has remained stable. When Catherine de Medici came to France in the 1540s, Italian influences came with her. Although food had always been visually appealing in France, the idea of food as theater was new. Under her reign as Queen and then Queen Mother of France (three of her sons became King of France), the dinners she hosted helped move French cuisine forward in history. Fine tableware and glassware became important during this period, and the use of color also took center stage. New foods were also introduced during this time, both from the Mediterranean, such as tomatoes, as well as from distant regions, such as green beans coming to France for the first time from the New World. One of the defining characteristics of a modern French meal is that there are several courses, served slowly and in succession. This concept was introduced at Versailles by King Louis XIV. Instead of allowing the food served ‘in confusion’ as before, the Sun King encouraged the servants to bring one dish at a time. It was also during this period that silverware became commonplace. Carême is one of the most well-known French chefs in history. Travelling the world, he brought another feature of contemporary French dining back to France: serving each guest at the table, which he learned in Russia. Carême was also known for his impressive feats of architecture with food, such as making bridges and towers out of pastries and breads. A walk by fancy French bakers' and pastry shop windows confirms that this practice is still a favorite in France. Montagné is another great French chef, who wrote what is still considered to be the Bible of French Cuisine: the Larousse Gastronomique. A comprehensive book, it provides every detail needed for a flawless French meal. This booked helped bring the standards he wrote about to every corner of France, decreasing the influence of regional cuisines, and increasing the influence of a national, French, culinary art. Escoffier is responsible for the modern way of preparing food in restaurants, meaning that different people prepare each part of a dish. While one chef is grilling the meat to perfection, another is preparing the sauce. This manner of cooking allowed all elements of the meal to be prepared by a person specialized in that area, as well as ensuring that all components are still hot when they arrive on the table. Many consider Escoffier to be the most prominent figure in establishing French haute cuisine. These traditional dishes, have now been fused with the nouvelle cuisine to form what is common in the 21st century. Since the 1950s, French food has been refined and pared down. While the basic principles of artistry and the refinement of taste remained central, this period reduced the serving size of the meal and increased the size of the plate to serve it on as well as the number of decorations around the food. The number of courses decreased, and varied according to the meal and the occasion. For example, while a midweek lunch may consist of only three courses, a seven course meal is common on weekends. While many traditional, both national and regional, dishes abound in modern French restaurants, French chefs are famous for innovation and using ingredients during the season when they are most abundant or tastiest. French food is not only delicious and beautiful, but eating a meal in a French restaurant is a leisurely delight for all of the senses. Mastering the French cuisine can take decades, but French restaurants bring this artistic gastronomy to patrons all over the world. The elements that make up modern food in France each date from different periods in the history of French cuisine, but they all come together to create one fantastic culinary culture.